Manon, at five weeks old, seems quite happy in the Long Gallery of the Australian Museum in Sydney. She’s not at all perturbed by the skeleton sitting in an armchair, another riding a horse and a third on an exercise bike. I suspect she will have to get used to such visits as her mother, Chiara, is a museum enthusiast. Chiara, pushing Manon in her buggy on her first trip out, is showing me her highlights of the Museum. The Long Gallery, the first gallery in the first museum in Australia, opened in 1857 to great acclaim. It later became the Skeletons’ Gallery. Now one part of the gallery has been redesigned as part of its present transformation into a Victorian Cabinet of Curiosities. The new design has drawn on the original fabric of the building and historic ways of storing and displaying material. It looks both stylish and contemporary and I love it. So does Chiara. “Are the shrunken heads still there?” she asks. “I don’t THINK those masks were real,” I reply. 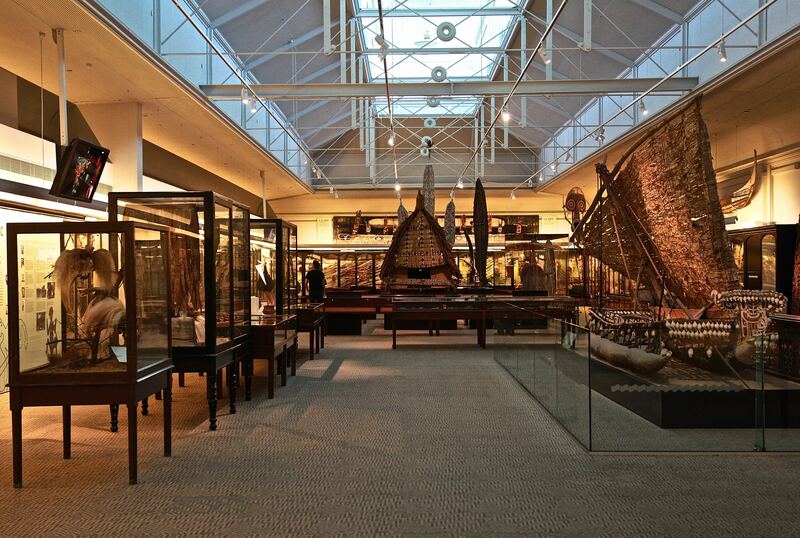 Pacific Cultures Gallery, South Australian Museum, Adelaide. Opened 1895. The Long Gallery also has one of the last remaining dioramas in Australia, now carefully restored. It is based on a research trip to Lord Howe Island in 1922. What is it about dioramas and these old fashioned Victorian settings that evoke a sense of magic that sleeker, high tech displays rarely achieve? We move onto the Indigenous Australians Gallery. 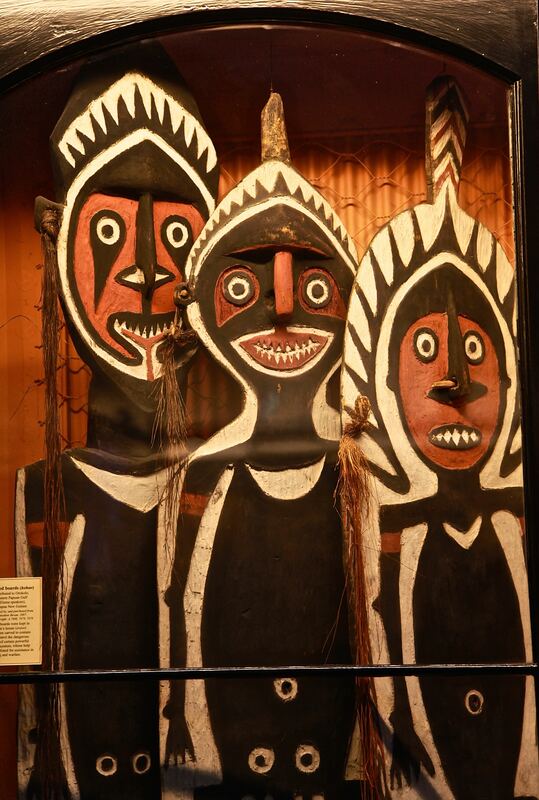 There are crocodile masks, bark paintings and boomerangs typical of a Museum that, traditionally, has looked at subjects from an anthropological or natural history perspective. But there is also information about land struggles and the Aboriginal Tent Assembly. I stop to read about the ‘stolen generations,’ that appalling practice of taking Aboriginal children from their families. Manon starts to howl. I don’t blame her. We move into Garrigarrang: Sea Country, a temporary exhibition about the deep connections between Indigenous Australians and the coast. She’s right. Wooden curved panels, edged with burnt etchings, echo the waves of the sea and provide a platform for the objects. There is a fine use of enlarged early prints of Indigenous people. Technology is used discretely. Fishes are projected onto muslin screens, suspended from the ceiling. A dance performance by Bangarra Dance Theatre about the moving friendship between a young Aboriginal girl, Patyegaranag, and one of the first settlers, is projected onto one wall. Issues of sustainability and sea rights are subtly integrated and there is a lovely use of art – ghost, or abandoned, nets that cause havoc in the sea have been made into a beautiful fish. Chiara is also an art historian. We go upstairs to visit a series of small vignettes of, What you can find in your back yard.’ Manon starts to howl. She must have spied the Sydney funnel-web spider in a girl’s pink wellington boot. The Sydney funnel-web is deadly. Yet, despite the scare stories, only a handful of the 120,000 deaths each year in Australia are from ‘snakes, crocs and sharks.’ The Australians like to scare tourists. The Museum, on their website, even perpetuates the stories of drop bears, who pick out tourists with non-Australian accents. “At least the Museum has a sense of humour,” says Chiara. But to more serious matters. But Manon is hungry and so are we. There isn’t time to discuss the pros and cons of having a dedicated museum for migration. After a lovely dim sum with Manon, Chiara and family I go to Hyde Park Barracks, designed by a convict architect, Francis Greenway. It opened in 1819 and accommodated male convicts who, during the day, went out in gangs to work on sites across Sydney and, at night, slept in canvas hammocks. On the ground floor is an impressive panoroma of Sydney, made in 1822, showing convict, free settler, military and Indigenous mixing together. It is, no doubt, an idealized, harmonious view but it seems relationships were not sour from the outset. ‘They (Indigenous people) bear themselves erect and address you with confidence, always in good humour and with grace,’ reads the text. They were the town’s gossip, seemed to know everyone and characters such as Bungarree, Cora Gooseberry and Warrah Warrah were well known. In 1848 Hyde Park Barracks became an immigration depot for women and sometimes children. Many were found employment through the hiring room or were collected by friends of family. Details and objects of their lives are represented in trunks and on bed sheets. Mary Cassidy entered a workhouse after her parents died during the Irish Famine. The following year she travelled with 233 other Irish orphans to Sydney. She was apprenticed to a seller of prints and music, married twice, had twelve children and spent her later years on the New Zealand Goldfields. Kate Stern, from Scotland migrated in 1866 with 644 migrants on the ship, Port Victor that endured terrible hurricane force winds. Within two days at the depot Kate was employed as a domestic. She later married a fellow Scotsman, a cabinet maker and had 3 children. Eerie silhouette figures on the top floor remind us of the waves of people who passed through this historic space – convicts, female and child migrants and later, when the building became an asylum, older, destitute and infirm women.Then, for almost a century, Hyde Park Barracks was used for courts of justice and government departments. Those who transformed it into a Museum in 1984 uncovered a wealth of personal and other artefacts from under the floorboards. I walk on to Sydney Museum. “Do you have anything about migration?” I ask the receptionist. I follow the receptionist’s instructions to the ‘first fleets’ wondering whether their passengers were convicts, settlers or migrants or all three. I read about the fate of the different boats but then move to the top floor. In the far corner is a small section about the Indigenous community in Sydney. I learn about Bennelong who played a ‘vital cross cultural role’ and even travelled to Britain with Governor Phillip before returning to Australia. Barangaroo, Bennelong’s wife, was pretty annoyed with her husband for going off to Britain and actively showed her disgust for the British practice of flogging. Colebee provided artists and botanists with information on native plants and animals. Daringha, his wife, befriended Elizabeth Macarthur. But relationships between Indigenous people and the invaders deteriorated. ‘ One by one the lands of the first Australians were taken over. Within a few years the colonists would be pitted against them in bitter struggle.’ Pemulwoy was one who engaged in that bitter struggle, leading 100 painted warriors down the street in the Battle of Parramatta. His head was sent to Britain when he was killed in 1802. I wonder where it is now? In another corner of the top floor is a series of lovely images of migrants who have settled in Sydney. Of Guangun Wu, a Chinese market gardener who came from China in 1990s, and of Shabnam Hameed, who came from Southern India at the age of 6 and is now an independent filmmaker. In the central area is a large exhibition about an architect, Harry Seidler, who has transformed Sydney’s skyline. Harry was a refugee from Nazism. As I leave the Museum I resist the temptation to tell the receptionist how much I enjoyed the stories of migration in her Museum. Hi Eithne, amazing (and confounding) how invisible migration history can seem in a global city like Sydney! Did you meet with anyone from the Migration Heritage Centre NSW? Of course as you’ve found the Australian National Maritime Museum is great on migration past and present. There’s also a host of council-level museums like Fairfield City Museum and Gallery http://www.livingmuseum.com.au/learn/museum/online-exhibitions/changing-places. Have really enjoyed your blog posts, safe travels back and look forward to catching up on this side of the pond. Lovely to hear from you and great to get your comments. Oh I missed the Migration Heritage Centre and the Fairfield City Museum – have to go back!Yes lets meet up on this side of the pond. Back now – as you can see from my last post. Be great to hear, as requested in my last post, where to go from here on my blog! Email me some dates to meet.